We at cash for gold, are an experienced and authorized team to acknowledge the values of the most expensive elements on the earth's crust. We have served for 20 years and are counting for more and have established more than 20 retail places all over Delhi NCR. If you are unsure about what we do and how we do, then you have come in contact with us. We have known as the most trusted jewelry buyers in the entire territory. As we offer a great variety of services to our clients and customers, we provide the highest value for any precious metal item. Also, we offer instant cash without any discussion further or beyond, Though we give other preferred media of transaction but the most favourable for our customers has come out to be instant cash. Other than this, we offer our services from start to finding the quote absolutely free of any charge. Also, we offer 100% value as well as full transparency and honesty from us. We buy not only gold but also silver, platinum, and diamond a well. 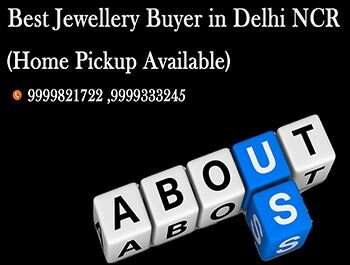 Cash for gold has been in the topmost jewelry buyers in the entire NCR. But we wish to spread our horizons all over India. We wish to maintain the same service throughout our time for all our customers. We wish to build a good relationship with our sellers. Along with everything, we wish to offer more benefits as well as other profits to earn from old valuables. Also, we believe to inform all the details to our customers and take full consent on any future deal we make. We hope to improve all the possible details required to make a good efforted sale. Our main motto is to offer the best value to our customers to make them more confident about the profit they will be getting only with us. It is only possible to do an exchange with the valuables like precious metals and stones. We aim to offer a bigger return on what the items were bought before or even from the other jewelry buyers has given. Also, we do all the testing in the international system to evaluate properly and thus we attain a final conclusion on the accurate value of the precious metals.